Extra Gear TV show on BBC America. Host Rory Reid. Credit: © TopGear.com. BBC America announces the world’s biggest car series, Top Gear, will have a new after-show, Extra Gear, presented by Top Gear host Rory Reid, on BBC America. The Extra Gear TV series will air immediately after Top Gear. Filmed at the Top Gear studio, BBC America says that each week, Extra Gear will bring fans exclusive new footage, interviews, and specially recorded films, as well as behind-the-scenes looks at Top Gear. To rev your engines, watch these two Top Gear TV show trailers. Get all the Extra Gear details from this Top Gear TV series press release. New York – April 26, 2016 – BBC AMERICA’s Top Gear is back with a new season in May. 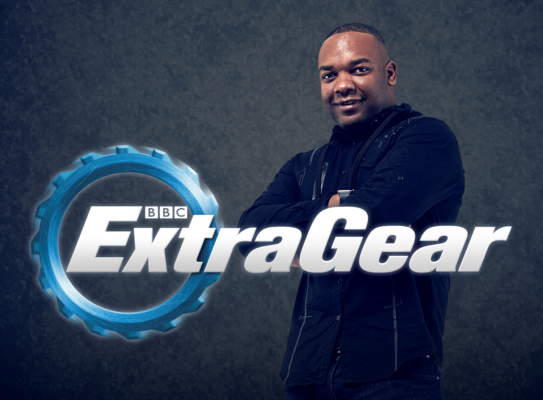 Announced today, the world’s biggest car series will have a new after show, Extra Gear, presented by Top Gear host Rory Reid on BBC AMERICA. Fans will be able to get closer to the Top Gear action than ever before with Extra Gear airing immediately following new episodes this season on BBC AMERICA. Filmed at the famous Top Gear studio, each week Extra Gear will bring fans exclusive new footage, interviews, specially recorded films and behind-the-scenes access to the hit series. Extra Gear is co-commissioned by BBC Worldwide and BBC Three and distributed internationally by BBC Worldwide. Created in 1998, BBC AMERICA is a hub of innovative, culturally contagious programming like the ground-breaking un-scripted series Top Gear, the top-rated science-fiction phenomenon Doctor Who, and the fan-favorite Orphan Black. The influential channel has been the launch pad for talent including Ricky Gervais, Gordon Ramsay, and Graham Norton — all adopted as American pop culture icons. A joint venture between BBC Worldwide (the commercial arm of the BBC) and AMC Networks, BBCA has attracted both critical acclaim and major awards including four Emmy® Awards, five Golden Globes® and 12 Peabody Awards. The irrepressible network has garnered one of cable’s most curious, educated and affluent audiences, with many properties boasting super-fan levels of engagement. Available on cable and satellite TV in 76 million homes, BBC AMERICA broadcasts in both standard and high-definition, is available On Demand across all major digital platforms and offers full episodes online at bbcamerica.com. Find out more by visiting press.bbcamerica.com or follow us on twitter.com/bbcamerica. What do you think? How do you like the sound of BBC America’s Extra Gear TV show? Do you plan to watch the series premiere, after Top Gear? More about: BBC America TV shows: canceled or renewed?, Extra Gear, Extra Gear: canceled or renewed?, Top Gear, Top Gear: canceled or renewed?